Just because your chair looks old doesn’t mean you have to throw it to the curb. Thankfully for upholstery professionals, they are able to freshen up your chair with new fabric, springs, foam and/or a completely new style. Using a specialized skill, reupholstering your chair is a great way to restyle a set or preserve a family heirloom. How much does it cost to reupholster a chair? The cost to reupholster a chair is based on a few factors, including the type of chair you want to be upholstered, the details involved, the professional you have and your geographical region. Generally, the more detail that’s involved with the reupholstering job, the more you should be prepared to pay, but check out the factors affecting the pricing below for more details as to what you may pay. With so many factors, again, based on the size of the chair, as well as the details, we created a table of the average costs we found, as well as prices we found online from those who were willing to share the costs they paid. The table above mentions the prices you should be prepared to pay on average, and as you can see, the price range is quite large, making it hard to decipher exactly what you should budget. To make it even easier, we compiled the many quotes we found online and included the price they paid, as well as a description of the job. JHConklin.net, for instance, posted a variety of their past jobs, along with the price quoted for each job. This is a good resource for those who actually want to see the before and after pictures, along with the prices their customers paid. Fabric: One of the biggest factors, according to Thumbtack.com, will be the fabric. For example, a single dining room seat often requires less than one yard per fabric, simply meaning the labor and the materials will be much less than replacing the fabric on the entire seat, including the seat and the back, which can often require more than five yards, all depending on the fabric and the pattern. As for lounge chairs, again, depending on the size, can take an average of five to eight yards in the fabric. Just like clothing or any materials for that matter, chair fabric can range from as little as $10 to more than $125+ per yard for just the material. Labor: The more experienced an upholster is, the more you should be prepared to pay. Emphasizing the factors mentioned prior, the size and the detail involved can greatly affect the overall costs, including both the fabric, mentioned prior, and the labor fees. If only the seat of the chair needs to be upholstered and the seats are removable, then this is a much faster job than a seat which requires the backing and the seat upholstered. Discounts: In some cases, there is a good chance you may need to bring in more than one chair that needs to be reupholstered, and most professionals, from the estimates we saw online, will often offer a bulk chair discount. This discount, depending on the professional’s policy, may require a minimum before the discount is applied, however. Geographical location: All locations, as with any professional service, will not be created equal in price, meaning you will pay much more in a metropolitan city than you would in a rural small town. 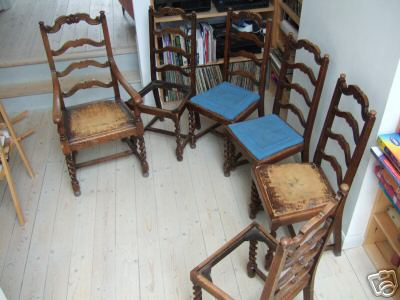 Repairs: What kind of repairs need to be done to the chair? Aside from the fabric, does the wood need to be replaced due to rotting? What about the spring system? Do the springs and the wood need to be replaced? As you can imagine, all of these repairs, while the chair is being torn apart, will need to be replaced and can increase the labor time. Typically, the frame in a solid chair will last up to 15 years, so if your chair is older than this, then you may want to be prepared for this repair.